Recently notice published Combined 8 Bank Senior Officer Exam Date and Seat Plan Changed. Combined eight Bank Senior Officer Exam Date and Seat Plan has been published. MCQ Exam Date & Seat Plan has published in Combined eight Bank by their official website erecruitment.bb.org.bd. For related candidates admission form for MCQ Exam Date for direct recruitment of some vacancies of “Senior Officer” in Combined Eight Bank recruitment. Combined Eight Bank MCQ Exam will be held on 12 January 2018. Combined 8 Bank has published result on officer post. Its an attractive job and great opportunities to get job for related job seeker. This job is perfect to build up a significant career. Those, who want to work ,they should be taken out of this opportunity. Combined 8 Bank is a most amazing Government bank in Bangladesh. Under the supervision of the Bankers Selection Committee for the appointment of some vacant posts of Combined 8 Bank. Senior Officer ” Cash” MCQ test application for online application of candidates for participation. MCQ Exam date and Admit Card Download is upload on the Bangladesh Bank website (https://erecruitment.bb.org.bd). Note that after the due date, there no opportunity to collect the entrance test. Please stay turn us our website CHomeBD.Com for get more all bank circular, Exam date and Results. Thanks for visiting our site. 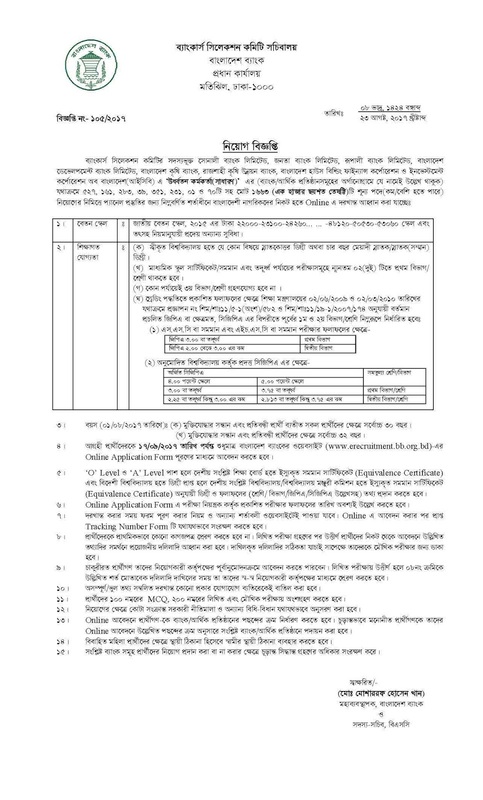 Notes: We are Published Every Month Weekly Jobs Notice, Exam Schedule, Exam Notice, Admission Notice, Weekly Jobs Newspaper (Chakrir Dak, Chakri-Bakri, Chakrir Khobor, Chakrir Khoj) from various Newspaper at CHomeBD.Com. Keep Stay Visit our website For Next Friday jobs Newspaper. Click Here to view or download PDF/JPEG file format as JOBS Newspaper. This is a mobile responsive site for better view on your Android/OS platform.